I had not heard of these blades until recently. I picked up some from Joe at Shaveabuck. For me this is an outstanding blade. I have one loaded in to a Krona and one in to a Gillette Long Handle Adjustable (setting 3). I have been using Proraso Red and Blue (tube), Proraso White (tub), and tonight TOBS Avocado. I am getting close, comfortable shaves. For me, I rank this blade right up there with Gillette Yellows/Blues and Astra Platinums. Glad I discovered them..they will get regular use. 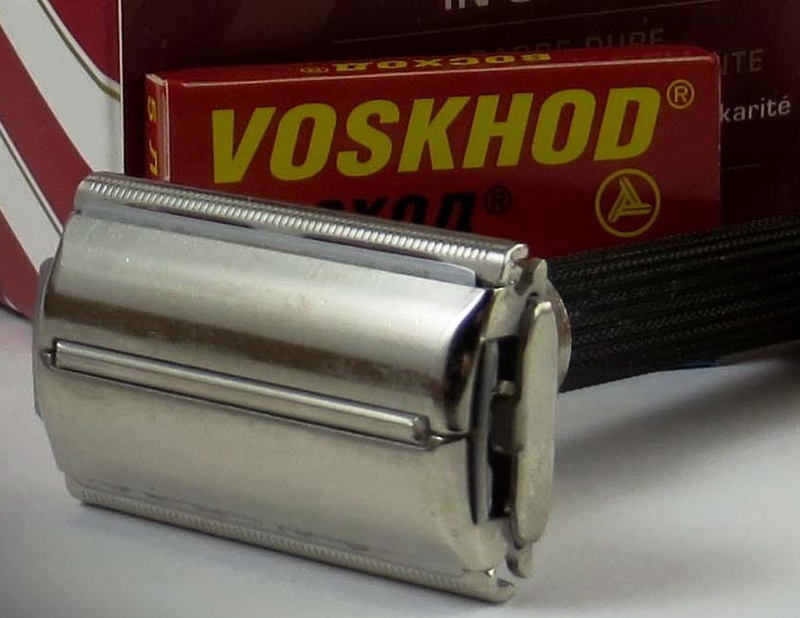 Voskhod are, together with Iridium Super, my regular blades for daily shave. I use to alternate them and I am really happy with their performance. I've not found any I like better. They are a very decent blade. I believe made in Russia. A local Apothecary had them for $11 Per 100. Hard to pass up. I used one for the 1st time this morning and was very impressed also. Very similar to Sputniks for me. They were very similar to med preps for me. These are one of my favorites too. I'll take these over most. Yet another one of those "YMMV" - I know a lot of people like them but I've tried them a couple of times and did find them to be tuggy for me. (04-23-2014, 12:00 AM)yomuppet Wrote: They were very similar to med preps for me. Great example of YMMV...The Voskhod's shave reasonably well for me with short beard growth, but definitely are tuggy in all my razors with anything more than two days growth. The Personna Med's on the other hand can mow down five days of growth without a tug, and feel just a tad less sharp than both my benchmark blades in the "sharp" department - kai & Feather. Opinions on blades are the victim of so many variables...Razor, your beard hair type/growth, shave prep and of course cream/soap/croap being used and lastly technique...With all these unknowns it makes sense that people have drastically different results using the same blade. IMO it's best to maintain a consistent setup to test blades with. This allows one to really feel only the changes blade to blade, making it much easier to find a baseline of what works for you. Voskhod are one of my preferred blades. I have over 300 in my stash. +1. To me, the Voskhod blades are average, and definitely inferior (less sharp?) than my preferred Personna Labs and Reds. I like them a lot, on bar with my blade of choice Shark SS. I just tried a Perma sharp and it too was excellent, albeit a thinner blade. I've found them to be a good daily driver! I tried one for the first time today, and found it outstanding. Super smooth. It was just one shave, so we'll see how they last. But for a first try, I was really impressed. I used a late 40's Aristocrat and Stirling Ozark Mountain soap, and it seemed to match up well. I've just ordered 50 from eBay. Looking forward to shaving with these. I dunno, I found these blades to be average on the first shave in a Cadet tto and super tuggy to unusable on shaves after that. Voskhod are great blades. They were my favorite until I discovered Perma Sharps. (10-21-2014, 11:04 AM)AngryGreek Wrote: Voskhod are great blades. They were my favorite until I discovered Perma Sharps. Perma Sharps are also great, but cost twice as much as Voskhods. Not sure if they are two times as good as a Voskhod. For those who like Voskhods, I suggest trying a Rapira Platinum Lux. I find it a tad smoother. Voskhods are one of my top 5 blades. A great daily driver, but not for when I have a few days of stubble.